Manufacturer of a proprietary line of plastic profile extrusions including extruded seals and gaskets,edge trims,decorative trims,lip trims,drip rail trims and custom extrusions. Trimco specializes in the lamination of tape and mylar onto flexible extrusions. Established 1968. 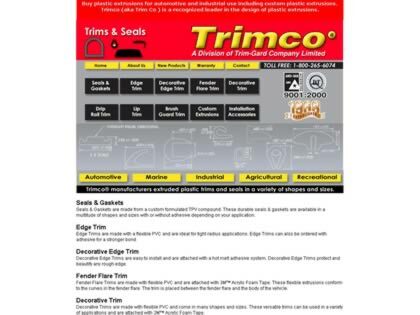 Web Site Snapshot: If available, above is a snapshot of the Trimco-Trims & Seals web site at http://www.trimco.info as it appeared when this site was added to the directory or last verified. Please Note that Boat Design Net has no involvement with the above web site; all content and images depicted in the above thumbnail are the property and copyright of Trimco-Trims & Seals unless otherwise noted on that site. Description: Manufacturer of a proprietary line of plastic profile extrusions including extruded seals and gaskets,edge trims,decorative trims,lip trims,drip rail trims and custom extrusions. Trimco specializes in the lamination of tape and mylar onto flexible extrusions. Established 1968.